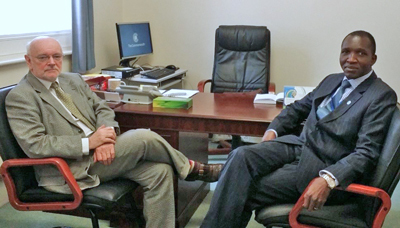 Professor Jeffrey Owen, the Director of the Global Tax Policy Centre of the Institute for Austrian and International Tax Law at WU (Vienna University of Economics and Business), recently paid a courtesy visit to the Executive Director. During the meeting on the 2nd February, 2015 at Marlborough House, London, the two appraised each other on the 2015 calendar events for their respective institutions. The Institute, based in Vienna, offers wide ranging degree programs on international taxation and on occasion provides some limited scholarships to qualifying candidates. To enhance its reach, the Institute has partnered with the Academy of Public Finance based in Pretoria South Africa to offer short-term training to tax officials. Professor Owen reiterated that his organization was ready to partner with CATA in hosting capacity building events and also by allowing staff from CATA member countries to benefit from the courses and training offered by the Institute. Some topics earmarked for this year would include specific technical issues around VAT and Excise, tax audits of the oil and gas sector, and transfer pricing. Click here for brochure. (iii) Impact of BEPs on tax treaties. The Executive Director noted that through this partnership CATA members would greatly benefit from the pool of subject matter experts that exist within the Global Tax Policy Centre. CATA Training Programmes for 2015 - Apply now!